After a good amount of time that has passed since the Nexus One's launch, one of its most anticipated accessories has finally landed into the Google Store. The Car Dock accessory now supplements the existing accessories for the powerhouse Android smartphone like the popular Desktop Dock and the recently made available spare battery. 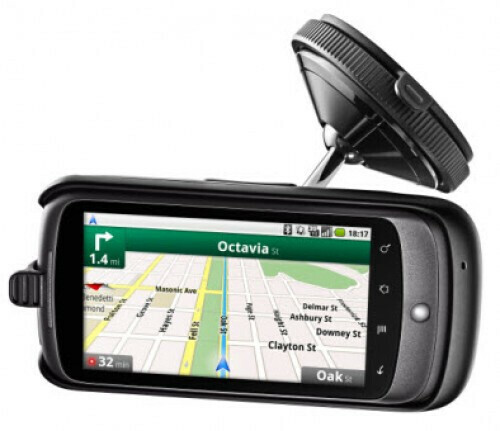 Luckily it can be fetched for a mere $55 which is easily more affordable than the TomTom car dock accessory for the iPhone that retails for $119.95 – plus it offers some similar features such as built-in speakers and a handy volume control right on the accessory. In addition, the Car Dock accessory has the ability to be rotated to a specific position to offer the best visibility for the user and will charge the Nexus One as long as it's plugged into the car's 12V utility socket. Even though it's nice that the accessory is finally available, there is no denying the unusual lack of availability of some of these common accessories from the start – still, it's better now than never we suppose. Wow I would diffently buy one of these for the Droid if it were to come out. Drooid! !!!! Luckily for you, it already exists.